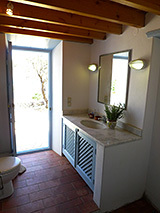 Very near to Patmos' main town and port of Skala, this small and characterful, stone built, whitewashed holiday rental cottage (a Mediterranean villa) is just 30 yards from the sea (the Aegean). It offers peace and quiet with a country feel, yet close to action. 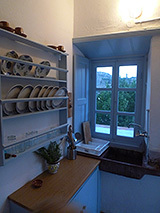 The house/villa for rent sits in its own grounds planted with fig trees, almonds and other fruit trees. Broad stone terraces overlooking the bay have shade for eating outside and breaks from sunbathing. 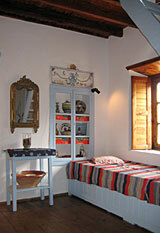 It is a traditional Greek country villa. The beach is sandy at the centre, tree-lined, and very sheltered for swimming and sunbathing. At its centre is one of the best tavernas on the island with another choice a little further on. Popular tavernas and sandy beaches at Agriolivadi and Kambos provide nearby alternatives for a day out. They are among several beaches which offer windsurfing, waterskiing and paddle canoes. There are many country paths for walking around the island, to further round out your Mediterranean holiday. A charming stone built, whitewashed villa with terraces facing the sea and a spacious garden. Sleeps 4. Ground floor: sitting room; dining room giving onto the three terraces; kitchen; bathroom with shower; bedroom with twin beds in traditional style. First floor: double bedroom; upper terrace. The villa has electricity, water and a well equipped kitchen with large refrigerator, cooking facilities and all you need for self catering. Linen is provided, but not beach towels. Before you arrive, the villa will be cleaned and the beds will be made up. Sheets and towels will be washed once a week. Further domestic help can be arranged for an extra charge. The housekeeper lives nearby. There is an excellent taverna a few hundred yards away. Patmos' main town and harbour of Skala with its shops, banks, cafes, bars, tavernas and nightlife is barely five minutes by car or taxi, or a 20 minute walk. Find out more about Patmos island, Greece, and things to do. When you arrive on the island, a taxi can take you to the house. Find out more about travel to the Dodecanese island of Patmos. Find out rental prices for the villa, availability and booking.